An open-source tool that allows anyone to design and build their own furniture, as well as share these within an online community. 584 backers pledged $31,475 to help bring this project to life. The goal for this project is not just to complete the software and release the source code, but also to build an online community of people creating, sharing and editing designs. Digital manufacturing processes open up a world of opportunity for producing unique individualised objects, but we think there is a lack of accessible digital tools that allow anybody to use these processes to design and make their own functional, personalised products. This furniture is designed or customized using a simple 2d drawing interface. The program automatically generates a structure for your chair and lets you simulate sitting on it with a virtual model of yourself. As you interact with the tool, it generates the cutting pattern for your design, which can then be sent to a digital fabrication machine. A physics engine tests the stability of the chair, allowing you to ensure that the chair will stand and comfortably support you. We have a working prototype of SketchChair, including a number of full size trial chairs. The program has a number of tools for making simple or complex changes to a design, such as adjusting profile outlines, changing the number of layers, or controlling the symmetry of the chair. These tools will continue to evolve as we develop the software. Once we have finished development, the program and the source will be freely available online. If you would love to start using the program and have the opportunity to watch and discuss its development with us, you can become a contributor with one of our pledge rewards! Within the program, users will be able to upload chairs they have created, which will then go on display at SketchChair.cc. Any of these chairs can then be downloaded and edited, allowing chair designs to evolve as users continually refine and modify them. In this way we hope that SketchChair will be like an open-source Ikea store, filled with customisable products! How can I get a SketchChair? We are offering pre-designed SketchChairs as pledge rewards, starting with the Antler Chair, our flagship design. There are already a number of Antler Chairs in existence, living in various parts of the world, and this design has travelled with us to a number of workshops, conferences and exhibitions. Co-designed with Nadeem Haidary and Defne Civelekoglu, the Rocking Stool is a fun and dynamic SketchChair that shows some more design features of the system. It is a simple and sturdy stool that lives comfortably in your living room. As a part of this campaign, we are also looking for people to collaborate with to create custom personalised SketchChairs. We will work with you to refine your own one-of-a-kind original! These chairs will also be an important part of the project development, and will forever remain as initial milestones in the SketchChair collection. Using the program, anybody will be able to export files to make SketchChairs. 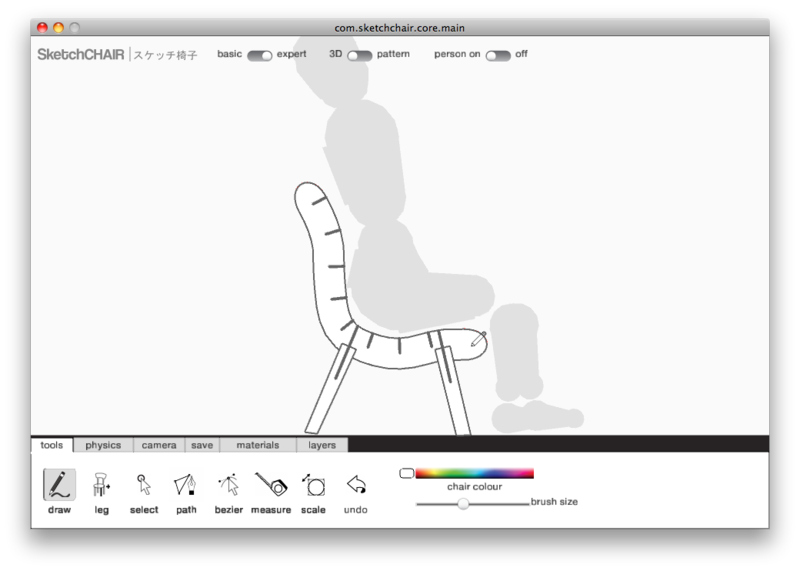 On SketchChair.cc people will be able to send designs to an online digital manufacturing service such as ponoko.com. Alternatively these files could also be sent to a local community workshop such as those listed on 100kgarages.com. After the parts are cut using a cnc router or laser cutter, they can be affordably posted as a flat package and then assembled by you at home. To say thank you for supporting the SketchChair project, for each $25 you pledge you can choose one from of a series of laser-cut SketchChair prototype miniatures. We’ll send you the parts for your numbered original, which you can assemble just like the real thing. Go to SketchChair.cc/minis for more images and descriptions of these designs! For special recognition as a contributor, higher pledges can choose to receive a mystery SketchChair miniature, each designed by us for you as a unique original collectable. We see a lot of potential in SketchChair as an engaging educational tool for introducing digital manufacturing processes and computational design. Whether cutting the parts on an inexpensive cnc paper cutter or with trusty scissors, SketchChair is a great hands-on activity for conducting design experiments. To promote SketchChair as a teaching tool we are offering ‘educator kits’ as pledge rewards. These include the complete series of laser-cut miniatures and a promotional poster demonstrating the SketchChair process. You will also be registered as an educator within the SketchChair.cc community, which will entitle you to special support from us once the software is released and you want to use it in the classroom. This project was started at the JST ERATO Design User Interface Project in Tokyo. This is a research lab that has a focus on building systems that engage end users with the design process, with the aims of fostering creativity and promoting product individualisation. We’re really excited about tools that include the end user in the design process! These give people the opportunity to enrich, and have a more personal relationship with the products that they buy, and we hope that this individuality and adaptability will also make SketchChairs less disposable, and therefore more sustainable. We hope that you are excited about SketchChair too and can help us make these customisable, open-source products a reality! Receive a printed Postcard SketchChair that you can cut out and assemble, with a big ‘thank you’ from us! More on SketchChair.cc/postcard. Become a collaborator! If you would love to already start using the prototype software, this will give you access to downloads of the work in progress and updates, as well as our development blog where we will post and discuss features of the program and look for suggestions. You will be credited on SketchChair.cc, and will keep a special ‘collaborator’ status in the online SketchChair community! Choose one from our series of collectable laser-cut SketchChair Miniatures. Each chair will be numbered and your contribution recognised on SketchChair.cc! Visit SketchChair.cc/minis for more images and details on these miniatures. We will design you your own unique original laser-cut miniature! Each chair will be presented on SketchChair.cc and accredited to your contribution! Receive our Educators Kit! We would love to see SketchChair used in classrooms, so we will send you the complete series of SketchChair Miniatures as well as a promotional poster. Once the program is released, we will also provide support to help you use it as an educational tool. We will collaborate with you to design you a custom personalised SketchChair! These will be recognised as important steps in the development of the software, and you will get a one-of-a-kind original. This will include miniatures and development sketches, and coffee with us if you live nearby!